March is already upon us which means it is time to start the ball rolling for Christmas in July 2018. Wow we are celebrating 18 years of miracle making all due to our very generous sponsors – you. Last year we were able to raise an impressive R250 000 for our charities. Here’s to believing we can do it again this year! Who are the amazing charities that will benefit from your generosity to CIJ 2018? 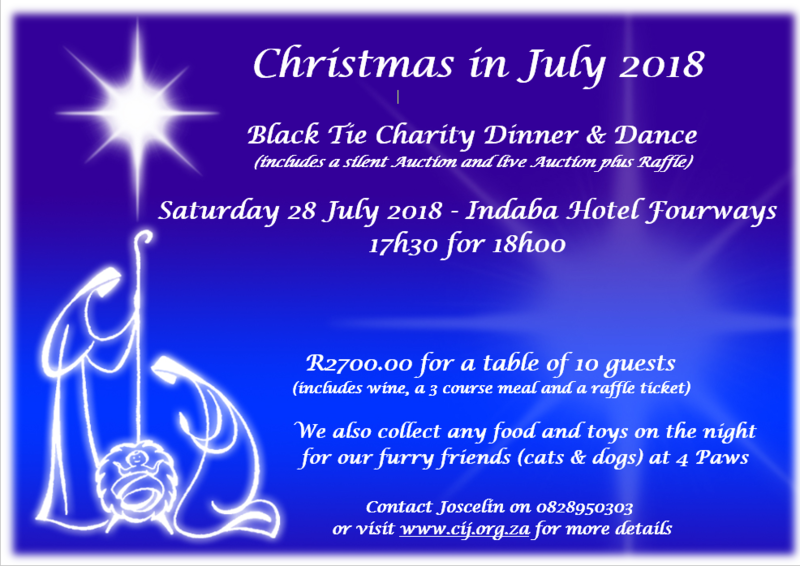 CIJ Enabling Fund – Christmas in July’s discretionary fund is used to enable people in their every day lives when life knocks them down and they need a helping hand to get back on their feet. Some of our projects in the past: Bishop’s discretionary fund in the Anglican Diocesan of Jhb; continuing education for orphaned children; helping families with HIV; assisting disadvantaged schools in local communities; reaching out to the Mabvuku community in Harare; Kingdom Consultant Centre; Compassionate Friends; The Rosebank Homeless Association Sewing Project; Headway; Friends of the Ballet; SPCA, Breaking the Chains Prison Ministry, Save The Rhino International etc. Just to mention a few, there are plenty more that need help. Family Worship Medical Care Centre (FWC) – FWC provides care for the terminally ill living with HIV/AIDS, helping them to live and die with dignity as well as offering health care services and shelter to HIV/Aids infected people in Hursthill, Johannesburg; an area rife with drug and alcohol abuse, teenage pregnancies etc. They also embrace all Frail Care conditions, Step-Downs, Hospice Care and HIV Care. 4 Paws – registered non-profit organisation, established July 2006 whose mission is to improve the quality of life for underprivileged animals by providing shelter, health care, veterinary treatments etc. CIJ created the job opportunity for Lumick the dog walker and want him to be able to continue. St Martin’s-in-the-Veld, Rosebank – exists to build God’s Kingdom by living and spreading the Gospel. The church is an essential part of our community, fully involved in every day living. There are several social outreach programmes and activities e.g. Soup Kitchen, Orphaned and Vulnerable Children, primary Health Care Clinic, Lotsha and Ukuphula Iketanga (Breaking the Chains – prison ministry) etc. St Pauls, Munsieville – The church was established in 1941 near Krugersdorp. There are 30,000 people living in the community of Munsieville and over 80% of them are unemployed, leaving the community very poor. This creates huge challenges for the small team of dedicated parishioners. Vuleka Primary School – opened in 1989 as a church based educational project working out of schools on church premises, starting with 59 children from previously disadvantaged communities. In 2016, Vuleka now educates over 1000 children from Grade 000 to Matric, offering quality education that is affordable and easily accessible to all, in a safe and secure environment. Donor funding is needed to keep school fees as low as possible, so they can continue to serve the community. I am looking forward to hearing from you soon and making you a miracle maker of CIJ 2018.